There are many that know the origin story of Hot Wheels, being that these were originally California Custom Miniature cars released in the late 1960’s and that the brand has gone through many metamorphoses through the years: Redlines, Spectraflame Paint, Flying Colors, Super Chromes, Real Riders, First Editions, Treasure Hunts, Race Team Cars, Adult Lines, Faster Than Ever Wheels, and in 2012, the Team Hot Wheels and the High Speed Wheels. While not receiving a lot of interest from collectors, there were a few that really liked the wheels on these vehicles. Rivaling the “Faster Than Ever” or FTE wheels that originated in 2005, these High-Speed Wheels (HSW) were built for speed on the Hot Wheels Track System. The wheels were made of acetyl (just like the original redlines), a low-friction material and the axles were nickel-plated, allowing for less friction as well. The wheels were colored to match drivers of the Team Hot Wheels branding–Red, Blue, Green & Yellow. The colors/teams were represented in this line in addition to white and classic black wheels. This line barely finished out in 2012, but the branding continued into 2013. 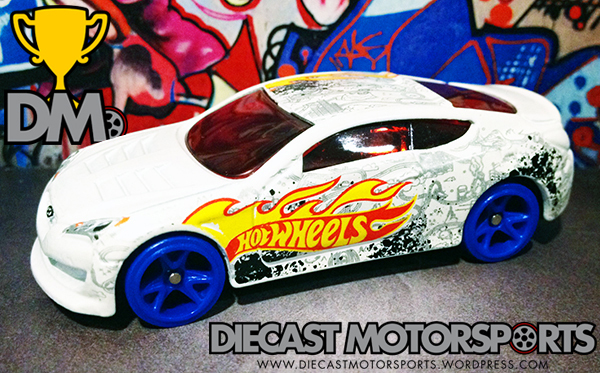 The grunge-style, kid-like, hand-drawn graphics originally designed by designated “flame guy”, Hot Wheels graphic artist Mike McClone, had carried into the mainline into 2013 and across several Hot Wheels lines including Monster Jam. Several collectors had even thought that this may be the “New Hot Wheels Race Team” and become very collectible just like the original Hot Wheels Race Team vehicles. This has only proven true with a couple of the cars in the last mix that was shortened due to the lines discontinuation. Lastly, the casting featured above, the Hyundai Genesis Coupe was originally released in the 2011 New Models series in blue. It then appeared in white in the aforementioned 2012 Team Hot Wheels High Speed Wheel line. An orange version spottily appeared as a multi-pack exclusive throughout 2013. The casting’s final release, as of now, was in the 2014 mainline series “HW Goal” that features cars with soccer graphics in recognition of that year’s World Cup in Brazil. These are all easily obtained through secondary market sites and you could have a complete casting collection of 4 sooner than later. RELEASE DETAILS: White Body (metal). Black Interior. Red-Tinted Windows. Blue High-Speed Wheels (HSW). Black Base (plastic). Made in Thailand.